After my enforced lay-off in hospital at the end of 2008, I'm pleased to announce that the South East and Kent Group meetings have resumed at the Halfway House this January. The first meet drew a good turn-out for the time of year and we shared the car park with a batch of AC Cobras (mostly kits I guess), a '64 Mustang and a '64 GTO Pontiac. Lots of changes since our last posting. 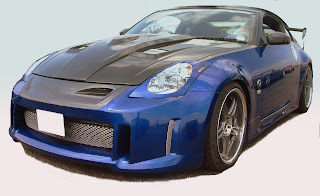 The 350Z now boasts new colour scheme of graphite grey over blue to blend in with the carbon fibre stuff. Carbon fibre mirror covers and A-post trims have been added. Wheels are upgraded to Volk GT-C, 9" x 19" front and 10.5" x 19" rear. Shod with Toyo tyres. Lowering by Eibach sorings and new shocks from Tokico D-Spec range. We tried a Sustec front underbrace, but ground clearance was too compromised for U.K. roads! Blitz R-VIT provides more vehicle information from the OBD2 port and Blitz R-FIT allows the fuel delivery to be modified - particularly useful for smoothing out the over-rich top end. Nismo titanium gearknob, Stillen short shifter, carbon weave gear gaiter and carbon cluster trim add to the interior - more to follow.